Around 11 percent of all drivers in West Virginia do not have the required minimum auto insurance coverage, according to a study by the Insurance Research Council. If you are involved in a car accident in West Virginia that is caused by a driver who has no insurance – or not enough – it can be difficult to recover the compensation you need and deserve. The driver responsible for causing the accident will likely have no resources to pay your claim without insurance coverage. People seriously hurt in a car accident caused by someone who has too little insurance can also find themselves in a very bad situation. The laws in West Virginia require car insurance policies to provide some protection in the form of uninsured motorist coverage (UM). Knowing how to make a claim and actually getting the money that you deserve can be very challenging. An experienced West Virginia car accident lawyer at the Underwood Law Offices can help you seek out all available sources of coverage, including uninsured and underinsured motorist coverage. Call us now or fill out our online contact form for a free evaluation of your potential claim with no strings attached. $10,000 in property damage liability insurance. This insurance pays for damage to other parties’ property when the insured driver causes a crash. $20,000/$40,000 in bodily injury liability coverage. These figures refer to the amount of insurance coverage available to pay accident victims injured by the insured. The $20,000 is per person, which means each injured accident victim can receive up to $20,000 from the insurance company. The $40,000 is per accident, so the insurance company will pay out a total of $40,000 in compensation to all accident victims. When a driver fails to purchase the required liability coverage, it can be very difficult for a car crash victim to recover compensation. Although the accident victim could sue the uninsured driver personally, this would likely be pointless. Even if the accident victim won, the uninsured driver would probably not have enough money to pay the judgment. The accident victim would likely find it impossible to recover the compensation that the court said he or she was entitled to. Uninsured motorist coverage is required in order to protect accident victims from this type of situation. How Do UM and UIM Policies Work? UM coverage is required in West Virginia. Drivers must purchase at least $10,000 in property damage and $20,000/$40,000 in UM coverage. This type of policy will cover drivers who are involved in a car accident caused by someone who does not have liability insurance. UM coverage can also apply in hit-and-run accidents. If the at-fault driver does not have insurance, you can make a claim on your UM policy. Your insurer would stand in for the other driver. If you can show that the uninsured driver was to blame for the accident and your injuries, you could recover compensation from your own insurance company. Underinsured motorist coverage works in a similar way to uninsured motorist coverage except that it applies in different situations. UIM coverage comes into play when a driver who causes an accident has only a limited amount of insurance and not enough to cover all of the accident losses. For example, if a driver purchased only the minimum in liability coverage and you experienced more than $20,000 in losses, you would have a difficult time obtaining full compensation from the negligent driver who hurt you. You could make a claim under your UIM policy for payment of the remaining balance of your losses. UM and UIM coverage are designed to make sure that victims do not face financial ruin due to a car accident caused by someone else’s negligence. However, insurance companies sometimes let their insured down by failing to pay out what they should. With UM or UIM coverage, you need to make a claim with your own insurer and work out the amount that you will be paid. Insurance companies generally want to pay out as little as possible on claims, even when the person making the claim is their own customer. Your insurance company may try to lowball your claim, delay paying you or deny a legitimate claim. You should not accept less than the law says your insurer should pay you. If you are injured, you need the money to get medical help. If you cannot work due to your injuries, the money from the UM or UIM claim may be a lifeline to allow you to support yourself and your family. You bought protection when you paid your car insurance premiums. An insurance company should not be able to get away with providing you less coverage than they promised. An experienced attorney at the Underwood Law Offices can help you to ensure that the insurance company pays you everything you deserve. Our goal is to maximize the compensation you receive, and we will work hard to make the insurance company play fair and pay out. We can work to prove your losses and negotiate a fair payout of your claim. If your insurance company acts unreasonably, we can also take strong legal action. When an insurance company unreasonably fails to pay what it should on a UM or UIM claim, the insurer may be said to be acting in bad faith. You may be able to prove that the insurer injured or harmed you through its unreasonable actions, and you can file a lawsuit to recover monetary damages for bad faith. In a bad faith claim, insurance companies may be required to pay additional compensation in excess of your actual car accident losses. The amount of money that you may receive could exceed your policy limits. Negotiating with the insurer or making a claim for bad faith are legally complex, especially when you are trying to cope with serious injuries after a car accident. Let our West Virginia car accident lawyers handle these issues for you. 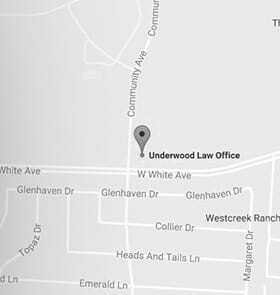 Schedule a free consultation with the Underwood Law Offices so we can explain what you might expect in your situation and how we can put our skills and experience to work for you and your family. Call our toll-free number 844.UNDERWOOD (844.863.3796) to learn how we can help or fill out our online form. There is no charge for the call or the claim evaluation, and there are no strings attached.